HSU brought the fight early, opening the game with a steal from Alexia Thrower. That steal resulted in a three pointer from Tyra Turner getting the Jacks on the scoreboard as more than 450 fans settled into their Lumberjack Arena seats. The Jacks continued to catch UC San Diego’s Tritons ball-watching as Turner slashed for a few lightly contested layups. The jumpers from Thrower and Turner continued and the pace of the game built. Madeline Hatch contributed to the crowds’ electricity, hitting a deep three and the Jacks took the lead 12-9 early. The University of San Diego’s women’s basketball team had won 16 straight games going into the game on Jan. 26 against HSU. Thirteen of those wins inside the California Collegiate Athletic Association, and included beating HSU 72-58 in the previous meeting. The rematch was an opportunity to knock off UCSD but most importantly show that HSU belongs in the discussion of the top three teams inside the league. The second quarter was back and forth misses at the basket. Both teams were able to get good looks but unable to beat the rim as they would bounce out. The lid wouldn’t come off the hoop from three pointers either as HSU shot a low 2-10 and UCSD shot 2-16 from behind the arch. Teams entered the locker room at the half shooting 36 percent overall and the score was UCSD 29, HSU 22. The second half was dominated by the Tritons forwards Mikayla Williams and Haleigh Hatfield. The Tritons passed the ball around the perimeter and took threes without worries. Miss or make the forwards were in the position to get rebounds for easy second-chance points. They finished the game with 14 and 12 rebounds, Williams’ 14 rebounds and 23 points on 9-13 shooting earned her another double-double adding to her already impressive season. Former CCAA player of the week Isamar Conde looked outmatched against the duo of Williams and Hatfield. 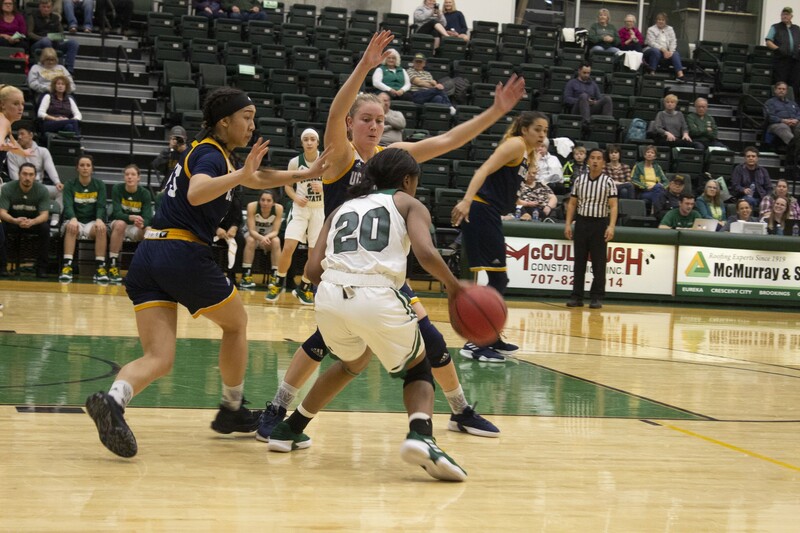 The exertion of trying to run out to the perimeter and stop the two in the inside may have contributed to her unusually poor shooting night, going 3-13 in 40 minutes of play. The Jacks made things interesting at the end led by Alexia Thrower’s 16 points and late steals. With four minutes left, Thrower, made a shot plus a foul getting a chance to add one more at the line. She missed but the Jacks were only down 49-53 and had some time. Finally, the Tritons saw enough and showed why they were coming into Humboldt undefeated and turned on the three-point shooting in the remaining minutes. Led by Joleen Yang San Diego who went 6-10 behind the line and snapped the Jacks five-game winning streak 72-61. “We got to learn from this game, fix some things and get better before next Saturday,” Bento-Jackson said.